Birdwatchers often come across bird names that include a person's name, either in the vernacular (English) name or latinised in the scientific nomenclature. Such names are properly called eponyms, and few people will not have been curious as to who some of these people were (or are). Names such as Darwin, Wallace, Audubon, Gould and (Gilbert) White are well known to most people. Keener birders will have yearned to see Pallas's Warbler, Hume's Owl, Swainson's Thrush, Steller's Eider or Brünnich's Guillemot. But few people today will have even heard of Albertina's Myna, Barraband's Parrot, Guerin's Helmetcrest or Savigny's Eagle Owl. 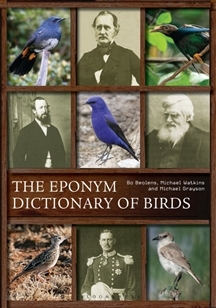 This extraordinary new work lists more than 4000 eponymous names covering 10 000 genera, species and subspecies of birds. 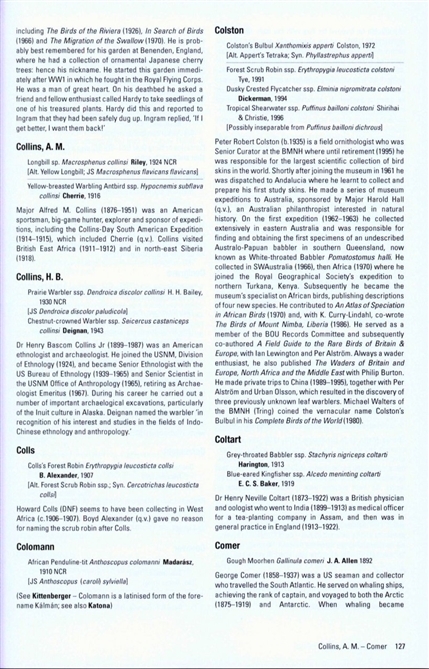 Every taxon with an eponymous vernacular or scientific name (whether in current usage or not) is listed, followed by a concise biography of the person concerned. These entries vary in length from a few lines to several paragraphs, depending on the availability of information or the importance of the individual's legacy. The text is punctuated with intriguing or little-known facts, unearthed in the course of the authors' extensive research. Ornithologists will find this an invaluable reference, especially to sort out birds named after people with identical surnames or in situations where only a person's forenames are used. But all birders will find much of interest in this fascinating volume, a book to dip into time and time again whenever their curiosity is aroused.